Welcome to the Noosa region, with its beautiful beaches, lush green hinterland, stunning coastal national park, pristine river, cosmopolitan lifestyle and lively calendar of events - it all adds up to an unforgettable holiday escape. With an inspiring dining scene and year-round warm and sunny climate, Noosa is the ideal place to kick back and escape from it all! 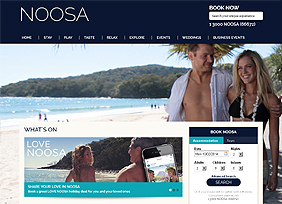 The official Tourism Noosa website provides the easiest and most comprehensive way to plan your next holiday in the Noosa region, with up-to-date information, tips and deals on a range of accommodation, tours, events, dining options, retail and much more. Our online booking system on this site is ready with hot deals and great properties and tours for you to book now! The park is located on the spectacular Cooloola Coast, which stretches from Noosa to Double Island Point up to Fraser Island. It is a great destination with a wilderness feel. BIG4 Noosa is the best boutique style holiday and caravan park in Noosa. With a range of accommodation and site options there is something to suit all tastes and budgets. Noosa Caravan Park is idyllically located within a short drive of pristine beaches and panoramic hinterland, in the heart of Tewantin. If you are looking for an escape to Noosa as either a couple or a family but without the price tag or the crowds then the Noosa North Shore Retreat is the perfect location for you. This hidden treasure located only 20 minutes from Hastings St is the perfect getaway for those wanting to discover a wilderness retreat only minutes from a pristine 50km beach. Luxury cottages set on 20 lakefront acres all feature double spas with views, wood fires for winter, air conditioning for summer. This hidden jewel, located between the ocean and the mountains evokes the senses and captures natures beauty. Enjoy the peace and ambiance of this unique venue, offering intimate country elegance for any special occasion. Luxury 1, 2 and 3-bedroom cottages, queen beds, full kitchen and laundry, reverse cycle heat/air, DVD, BBQ, carport, verandahs on 97 acres. Pet friendly. Disabled access and facilities. Panorama Blue is a resort-style B&B in Queensland on Australia's Sunshine Coast with spectacular views to Mount Cooroy and the Hinterland mountain range. The rooms are large apartments, with private sitting and dining areas, and spacious bathroom facilities, making this the perfect couple's retreat. Choice of the Garden Suite or the Courtyard Suite. Discover this absolute lakefront Noosa retreat nestled on the banks of pristine Lake Weyba. A selection of stunning lakefront accommodation, only a short drive to Noosa's fabulous restaurants and beach, or the Eumundi Markets. Andari Luxury Apartments are just across the road from the unspoilt beauty of Sunshine Beach, Noosa and a short stroll from the village with its award winning restaurants, cafes,Surf Club and Noosa National Park. Andari is centrally located for a luxury get away! This superb and much sought after complex is situated in a prime location, just a short walk from Hastings Street & Noosa National Park. A path leads through the complex to Park Rd, directly across from the stairs to Little Cove beach. Situated by the shores of Lake Doonella and the Noosa River. 186 air conditioned beach house style, fully self contained one & two bedroom apartments. 3 lagoon style pools and poolside BBQ area. 150 metres to Noosa Harbour marina offering restaurants, cafes, boat hire, river cruises, fishing charters and ferry transfers to Hastings Street. Noosa Convention & Exhibition Centre is located within the grounds. Chez Noosa Resort Motel is Noosa's affordable overnight or holiday option. There are 28 spacious one bedroom self contained apartments set around a beautiful pool/garden area. Located in the heart of Noosa, Nomads Noosa is the perfect place to stay: near the shops, banks, restaurants, supermarkets, local nightlife and only 800 metres away from Noosa Beach. Noosa Australia's favourite backpacker destination! The closest Noosa Backpackers to the Beach! Accommodation Bookings for all the best venues on the Sunshine Coast can be made through the Official Noosa Tourism website.